Bidding Wars are happening in Durham Region… HUGE ! are registered. Most people do not want to even entertain submitting their offer at this time. Sometimes couples decide to go head first and throw their bid in. 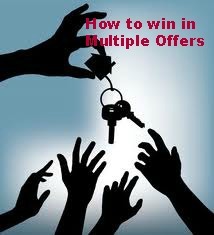 There are many different strategies to going about winning a bidding war and every situation is different. When you are trying to win a bidding war you must do things that you normally wouldn’t do in purchasing a house. Some of them are risky and sometimes you could pay later even more because of your decisions. The problem is some people put in an offer that isn’t even close to asking and full of conditions and it only is driving up the prices. If you are going to get into a bidding war, here are some useful techniques that may help you win. Strategies to winning a bidding war. 1. Remove clauses: Removing financing, home inspection clauses and other clauses are very risky but it is a sure way to entice the seller to accepting. The cleaner the offer, the better. 2. One strategy is to offer more than asking and remove conditions before they are accepting offers. This is a very frugal way to win but if you are considering not bidding this could work and give the owners something to think about. 3. Offer a large deposit. A large deposit indicates you have the funds to close the deal. 4. Closing Date: Give them the closing date they desire. In the end bidding wars are a lot like poker, you have to bring your best hand and you must watch out for bluffs. A good rule to use is to put yourself in their shoes. When you’ve found that perfect little house you’d like to call your home, the last thing you want is to have to compete with other potential buyers. But bidding wars – especially in hot real estate markets and urban centres – are more of a reality now than ever. So what do you need to know to stand the best chance at signing on the dotted “sold” line? Winning a bidding war is always a roll of the dice, but read on for the real deal on how to prepare before entering the multiple-bid realty trenches. Get pre-approved for a mortgage so you know the maximal financing available to you. By pre-qualifying for a loan, you’ll not only be aware of your offer’s ultimate ceiling, but you’ll shop around – and bid – accordingly. Speak with a broker to evaluate your options before you settle. A thumbs-up from the bank, along with agreeing to put down the biggest deposit or downpayment you can afford, can also help establish to sellers that you’re serious about buying their property. You don’t have to actually keep up with the Jones family, but when it comes to the houses you’re serious about bidding on, you do need to be aware of comparative market analysis. In other words, do research to learn what the fair market value for any house you’re interested in is considered to be, as well as the fair market value of similar houses that neighbour them. Real estate websites are good resources to get a sense of what’s out there. When you find out what comparable houses to the ones you’re looking at are going for, you’ll know if you’re shopping way beyond your means, or well within it. Knowing the current market value a house will fetch may also help you determine what you think other bidders will offer, to in turn establish the bid you want to make. Your Realtor should be protecting your best interests. Keep in mind, if the bank appraises the home and it doesn’t appraise for the price your offered, then what???? Don’t add unusual requests, terms or conditions to your bid, like, for example, buying someone’s home on the basis that you’ll first sell yours. Additional clauses contingent upon any extenuating circumstances can cause headache to vendors, who may have another offer at the exact price you’re tendering, but one without any loopholes. Which one would you choose? By nixing the contingency plan and making a “clean” or firm offer, you stand a better chance at getting what you want. Set aside a fund for pre-buy home inspections, which should cost about 1 per cent of the house’s asking price. This is often money well spent. If it turns out that the house you think you want to buy has a roof that’s about to fall in, better to know before you bid – especially since it might make you look twice at a very similar piece of property around the corner that is going for the same asking price, but with, for example, a recently renovated roof. Consider setting up a home inspection fund in case you end up in a bunch of bidding wars on houses lost to other buyers, since you’ll also have lost your home-inspection fee. Fancy art, furniture that’s moving out with the homeowner and gorgeous draperies may make a formerly drab house look fab, but none of those things will be there when you buy the house. As soon as the showing’s over, the homeowner may well ship that Persian rug back to the prop rental store it was leased from. Also, the drama in the colour of the paint in the living room, dining room and bedroom might look impressive, but might not suit your furniture…at all. Just because a house may show famously, doesn’t mean it’s the right one for you. Make sure you’re not being taken in by the smoke and mirrors of objects that are not part of the home’s innate architectural charm. Don’t bid $250,000 on a house whose asking price is $250,000 when you’re in a bidding war and your budget could easily permit you to extend $251,200. It may seem as though bidding an odd number would make little difference, but not only will your bid stand out from the rest, it may just beat an offer that came in at a slightly lower figure with a more common-sounding bid. Try to go back to see the house that seemed so magical to you on first viewing more than once – and more than a couple of times, if possible. One reason is that what strikes you as a great first impression may make a poorer second or third impression. Another reason is that more than a few sentimental homeowners have sold their house to a young family that somehow reminds them of themselves when they were starting out. Often, if you are able to meet the homeowner and they establish a connection with you, they may look upon your offer more favorably than that of another bidder – even if your competitor’s bid is higher. Try to figure out the vendor’s “trigger” – what it is that would make them sell. If you know that the homeowner has a certain closing date in mind which differs slightly from yours, offer to meet their ideal terms – sometimes this is all it takes to be selected over another bidder, even if the competing offer is higher. If you can afford to, add incentives like agreeing to pay all closing costs. And if you know the sellers are not looking forward to moving their weighty piano or basement-assembled pool table because it’s expensive to move and the closing date is tight, inquire about buying it to see if that will sweeten the deal. Bidding wars are a lot like gambling – the stakes are high and a lot of luck is involved. Rather than trying to figure out how much you can afford to bid without breaking the bank, try to strategically figure out the highest competing bid you’re trying to beat. If you don’t have finely honed psychic abilities, what helps is knowing the true value of the house. Let’s say you’re pre-approved for a $400,000 loan and the house you’re interested in bidding on would, according to your realtor’s estimation, be fairly priced at $350,000 as compared to other similar houses in the same ‘hood. If you know that the homeowners are not accepting offers ’til Saturday, and have listed the asking price at $345,000, and then find out Saturday that there are two other offers, think about what those two other offers might be. You may be smart to bid higher than their asking price and more than fair market value but still less than $400,000. In the end, don’t get caught up in the excitement of bidding. There’s an age-old maxim: “buy the most expensive house you can afford.” This is a savvy real estate suggestion, because if you can afford a $325,000 three-bedroom home but instead settle for a $275,000 one-bedroom home thinking you’ve saved some money, you could regret it sooner than you think. Consider that if you need that extra bedroom space – like if you and your partner decide to have kids – you’ll be looking to buy a new house, sell your current living space and move house in a relatively short period of time. It’s just common sense to make the highest offer you can afford that you’re comfortable with. Every time you visit a new property ask yourself: Is this the wrong house? That’s right, the wrong house. Rather than falling blindly in love with any given dwelling, play devil’s advocate with yourself, scrutinizing how the house you’re looking at right now is any different from the one around the corner that you just looked at. In bidding wars, there’s a grave danger of overpaying if you get swept up in the auction-like fray – know when to fold ’em, walk away and run. So before you engage in battle, arm yourself with credit pre-approval, a little research, an arsenal of financial strategies, heightened market value awareness and a great realtor. Then cross your fingers and go forth to find your own home sweet home. Call Michelle Makos, Re/Max First if you would like to feel like your best interests will ALWAYS come first.